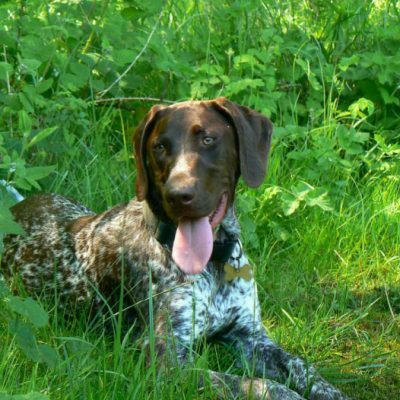 The German Shorthaired Pointer is an all-purpose gundog, he hunts and points at game in the open and in cover, he seems to be transfixed – then enthusiastically retrieves. They require plenty of exercise and need human company. 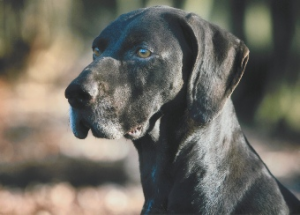 As with many working dogs that don’t meet the standards for rough shooting, they can end up as pets. 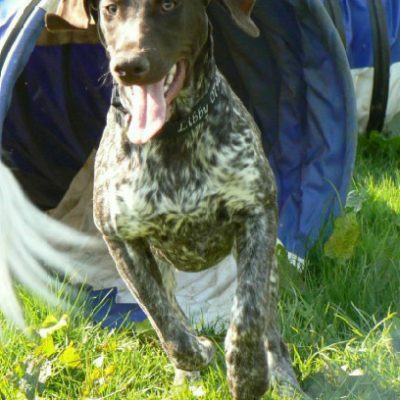 They are energetic, very trainable and affectionate. 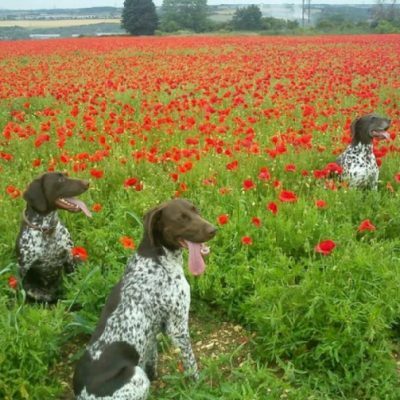 One of a German Shorthaired Pointers most endearing traits is his love of his people, they prefer to live as one of the family and are remarkable for their companionship traits and do not thrive away from people. Many dogs unless brought up from a very small puppy dislike kennelling, they often come into rescue for just this reason. 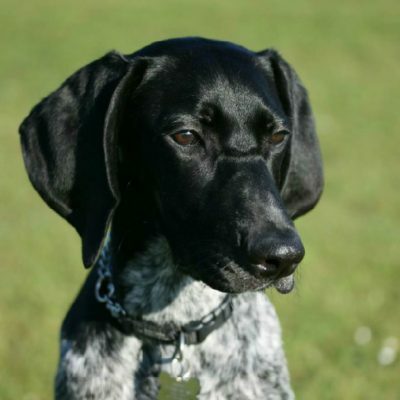 If you have to chastise a German Shorthaired Pointer the “more in sorrow than anger” approach usually works best. Endearing, Loving, Sneaky, Cheeky and Enthusiastic. The G.S.P. 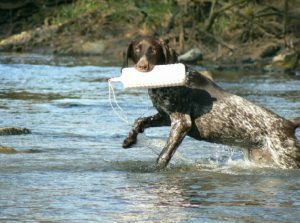 is an all-purpose gundog…a dog that hunts, points and retrieves. This takes no time at all to read but much more time to explain and understand. A dog that would work in all conditions of weather and cover. 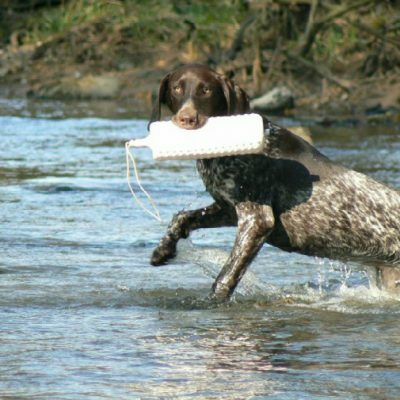 Would hunt, point and retrieve tenderly on land or in the water. Act as a guard against poachers. This is only part of the description of a G.S.P. The last two sentences do not appear anywhere in the English standard. 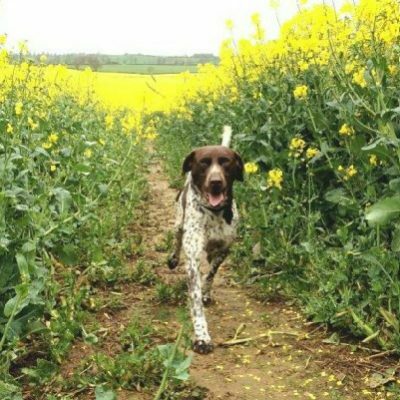 What few people new to the world of dogs will understand from the foregoing is that any breeder would consider themselves very lucky if one puppy out of a litter came near the specification in all it’s aspects. 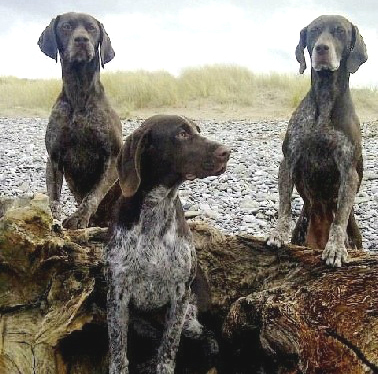 Any dog bred to do the work of three or four breeds combined must have more intelligence that is the norm in most of the other gundog groups. This is a trait equally demanded in both the German and the English standards, it can equally be described as obstinacy. This is a trait that was only sought by the Germans, but it must be born in mind that this can crop up to a great degree in the most unexpected places. It is a convenient trait in a house dog, but it can cause problems when allied with character defects. 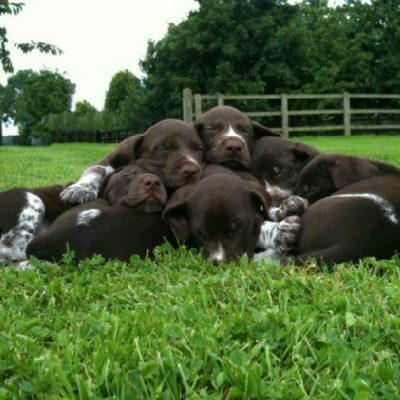 If you would like a guard dog you would need one specifically bred for this purpose. To be brave against predators can be a polite way of saying that they should have a killer instinct, and in Field Trials on the Continent the dogs are required to kill a small animal such as a fox. German predators can be much fiercer and bigger than any likely to be met in this country and it is not unknown for GSP’s to kill cats unless trained not to do so. 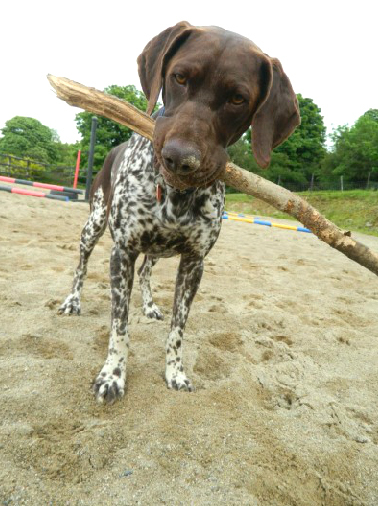 Most responsible breeders look first for working homes, then show homes and lastly pet homes. 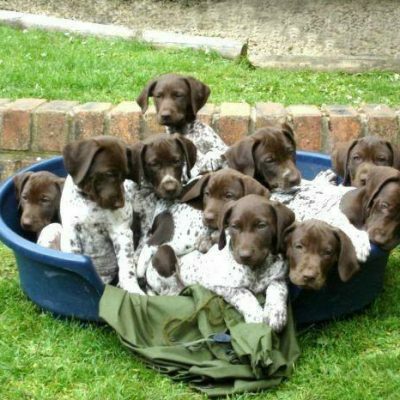 Many puppies are registered each year so it is obvious that a great many are going to pet homes. 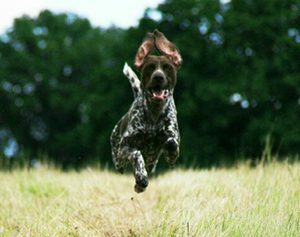 People see some of the gundog breeds leading very quiet sedentary lives and imagine that all gundog breeds are the same, with the same requirements. This is a most dangerous generalisation. Some dogs in every breed are going to behave outside the norm of their breed. 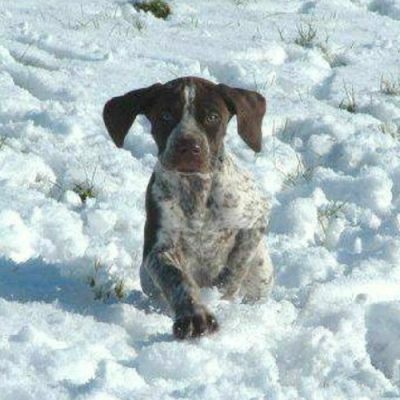 A GSP by it’s very breeding for a highly difficult and complex number of expectations, is not going to be a norm within the gundog group. They have been bred to work outside in all weathers, eight hours a day seven days a week and some of them are capable of doing just that. They need plenty of varied exercise, they need human love and companionship and they need occupying. They are like children and are slow to mature , some never do, and their adolescence can be very trying. They are physically strong dogs with strong wills and need consistent handling from the cradle to the grave. Discipline with a capital D and training with a capital T often stifles the initiative and can produce hard-headed dogs. Many are like a piece of elastic, the harder you pull your end the further away the other end becomes! One of the most endearing traits is his love of his people and unless brought up from a very small puppy to kennelling, they prefer to live as one of the family. They are remarkable for their companionship traits and do not thrive away from people. Many dogs come into rescue for just this reason. 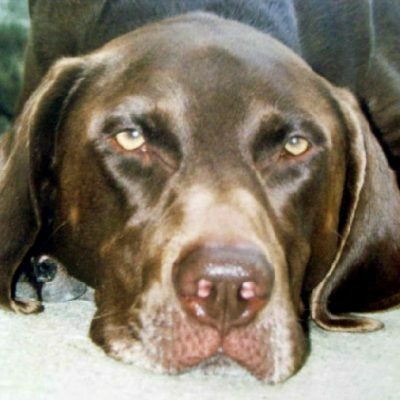 If you have to chastise a GSP the “more in sorrow than anger” usually works the best. They should never be allowed to exercise without supervision. A good home does not need acres of land for him to roam. Nor is it possible to share a picture book garden with one unless you fence off a fairly large area of it for him to enthusiastically turn into mountains of the moon! They love to dig. If shut outside or inside for long periods on their own they can become very noisy and destructive. They can also use their considerable enterprise and initiative to escape in order to find the company, exercise and interest that they need. Before taking one on be very sure all the members of your family are equally keen. Are you young. strong and patient? Do you love long walks? Live within easy reach of the countryside or a large park? This is not the breed for the elderly, no matter how active, and young children can get knocked about by a thoughtless dog. 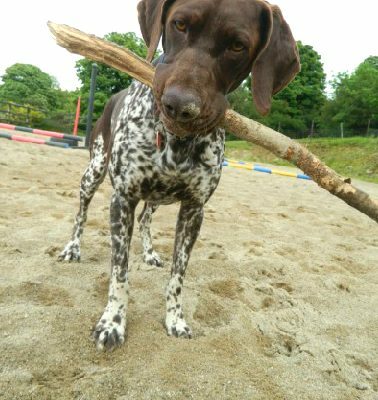 They have an average life expectancy of 12 yrs so unless you can see your future stretching before you without overseas postings, or having to change your accommodation into places where dogs are not allowed – don’t have one. It will break both yours and the dog’s hearts to part and they are not the easiest breed to re-home. The Kennel Club will be pleased to give you the names and addresses of the current secretaries. if they are not in the “other” then I don’t want to go.